MARK LORAM, : Mtarfa, Malta. 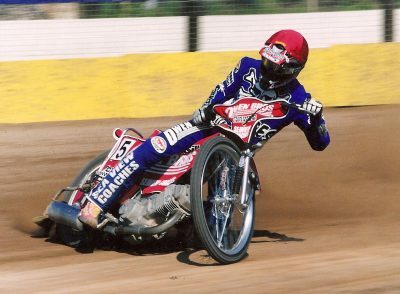 Already a proven star throughout the speedway world, Mark was first linked with Poole in 1998, but no deal was brokered until the following year when the Ford / Golding promotion tempted him to agree terms and become a Pirate. His first year at the club was nothing short of sensational, with him scoring 303 points from his league and cup appearances, while helping the Pirates to a fighting second place finish in the league standings, just one point shy of claiming the championship title. A real thrill-maker, his spectacular racing style got the fans talking and put the buzz back on the terraces at Wimborne Road. 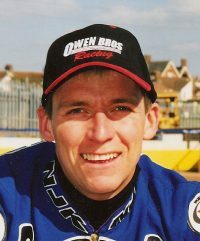 He also captured a unique track record at Poole during the season, lowering the Heat 15 six lap record on no less than six occasions. Individually his year was just as good, with the highlights coming at Coventry where he became the second Poole rider to win the British Championship title and in Linkoping where he upset the form book to win the Swedish Grand Prix. He continued to pile up the high scores and excite the fans during the millennium year, scoring 400 points to end the term with a 9.88 average. it was his Grand Prix exploits that caught the eye with his consistent performances seeing him crowned World champion despite him not winning any of the six Grand Prix rounds. He was however, the only rider to reach every semi final which, along with runner-up finishes in the opening two rounds in the Czech Republik and Sweden, gave him enough points to become the first Poole rider to win the title. His adoring fans gave him a homecoming worthy of a World champion, with the packed stadium giving him a welcome that could be heard all across the town. His popularity was such that he was voted BBC South’s Sports Personality of the Year, winning 63% of the votes cast and to head off the challenge from stars of the sports world. Made 56 League and Knockout Cup appearances for the club and scored 703 points. Was inducted into the Poole Speedway Hall of Fame in 2010.